"Adventure is found in unlikely places." Profile: Landfill can't understand why the other Autobots steer clear of him. He's generally a friendly, cheerful, hard-working, reliable fellow - what is the problem, he wonders? Unfortunately for Landfill, he needs to look no further than his rearview mirror for the answer. One of the unpleasant side effects of his job is the awful smell. And Landfill does little to minimize it. He leaves a trail of rotting refuse wherever he goes. He's usually caked in muck and filth. He's a veritable rolling garbage dump! Neither gentle hints from friends nor direct orders from superiors can persuade him to improve his personal hygiene. However, he earns the Autobots' appreciation for his willingness to undertake some of the most difficult and disgusting transport tasks. He'll haul a load of spare parts or toxic waste through a hail of enemy fire with equal enthusiasm, proving to his fellow Autobots that even steel-plated slobs have their value. Landfill is teamed with the Nebulans Silencer and Flintlock. Silencer chose to undergo the bio-engineering procedure needed to become an Autobot Targetmaster after witnessing the destruction of his family's hydroponic farm by the Scorponok-led Decepticons who invaded Nebulos. A quiet man who once abhored the use of force for any reason, he has become one of the best warriors among the Autobots' Nebulan allies. Flintlock is a young man who was always eager for action. In fact, within the peaceful constraints of traditional Nebulan society, he was often too eager - he constantly ran afoul of Nebulan authorities for behavior they cited as "anti-social, anti-governmental and rude." Once the Autobots landed on Nebulos and sought Nebulan volunteers to help them thwart the Decepticon threat, Flintlock found a positive outlet for his aggression. Now he is considered one of the toughest, bravest, and surprisingly, most disciplined soldiers among the Autobots. Abilities: Landfill can transform into a dump truck. He can haul up to 10 tons of solid material in this mode. His maximum speed is 70 mph and his range is 350 miles. Silencer has been bio-engineered to convert to a noiseless, recoilless, high-powered proton rifle. He is accurate up to six miles in this mode. Flintlock has been bio-engineered to convert to a stress pistol. In this mode he can shoot a beam of torsional energy that introduces counter-rotational forces within any metal object it hits. These forces induce metal fatigue and eventually metal failure, causing the target to fracture. An infra-red targeting sight allows Flintlock to home in on warm metal objects, such as enemy Decepticons with their engines running. 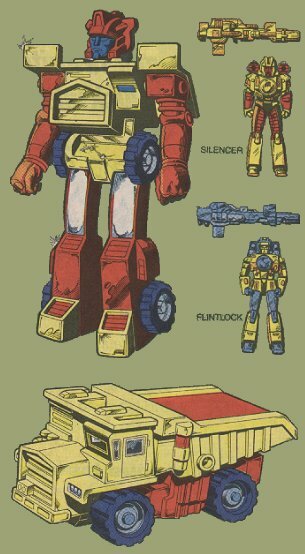 Landfill can use Silencer and Flintlock in his robot or dump truck mode. The two Nebulans can combine to form one weapon that retains the offensive capabilities of both its components. Weaknesses: Landfill's primary liability is completely controllable. He leaves so obvious a trail of trash and emits such a powerful odor that even the dumbest Decepticon tracker would have no difficulty finding him.